We’re pleased to announce that our dealership received an award from Fiat Chrysler Automobiles (FCA) because they told us that we were #1 in new car sales growth month over month from 2016 to 2017! 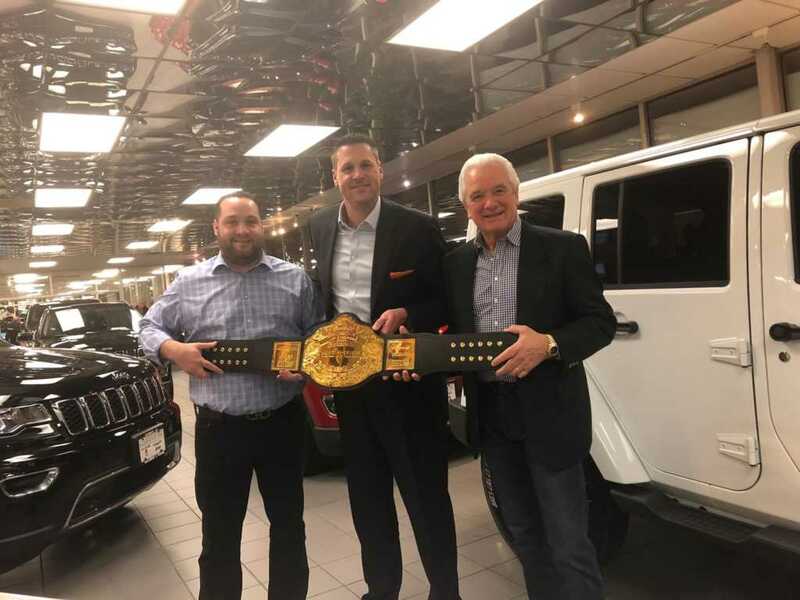 Mike and Chip Duane, Managing Partner & President of Salerno Duane Auto Group, recently accepted this prestigious award from Jeff Strickland, Northeast Business Center Director at FCA North America, at our showroom location in Summit NJ. We were shocked that it came in the form of a championship belt. Whether it’s pro wrestling, MMA or boxing, a championship belt is the ultimate recognition of winning that shows you’re #1. We would not only like to thank our hardworking staff for always bringing their A game every day at the dealership, but we want to extend our gratitude to our customers for choosing us with their car buying experience. We want to thank the Northeast Business Center Sector of FCA North America for recognizing us with this sales growth award. If you have any questions for us, please contact our team to learn why we’re an award-winning dealership.